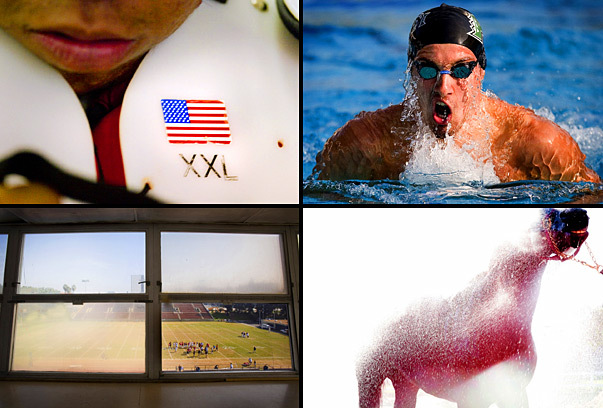 BEST PORTFOLIO WINNER: Images from Allan Campbell's winning portfolio at Sports Shooter Academy III. SportsShooter.com member Allan Campbell from the Eagle Newspapers in Oregon and SportsShooter.com member Daryl Peveto, a student at Brooks Institute of Photography, won the Sports Shooter Academy III "Best Portfolio" awards as selected by the workshop's instructors. Cal State Fullerton student and SportsShooter.com member Carlos Delgado's photo of betters staring at TV monitors at Hollywood Park Race Track took home top honors winning the "Best Single Photograph". Campbell, Peveto and Delgado each won a Speed Modulus belt system provided by Think Tank Photo. SportsShooter.com member Kirk Irwin, a student at Syracuse University won the third "Photo of the Day" award for his photograph of a swimmer's toes leaving the starting block with a trail of water taken during the Big West Shootout at U.C. Irvine. "Allan's photo of the coach at swimming had the feel of Bear Bryant or Tom Landry," said SSA III faculty member and SportsShooter.com member Matt Brown. "It's a photo you can only hope your paper would run. We didn't see a lot of coaches photos which is too bad. It wouldn't have made a difference, Allen had the best," Brown added. The Sports Shooter Academy was held Nov. 1 – 5, 2006 in Orange County, Calif. and involved over 50 photographers, students, faculty and staff, most of which were SportsShooter.com members. Registered participants shot several sports events a day with editing and critique sessions each evening. "As we talk about seeing pictures during the workshop we could hold up Campbell's pictures up as an example. His backgrounds are always clean and his pictures different to look at," said workshop instructor and SportsShooter.com member Michael Goulding of the Orange County Register. "The cowboy hat coach, the Hollywood sign in the racing picture and the volleyball action photo are good examples of 'seeing' that we preach during this workshop," Goulding added. 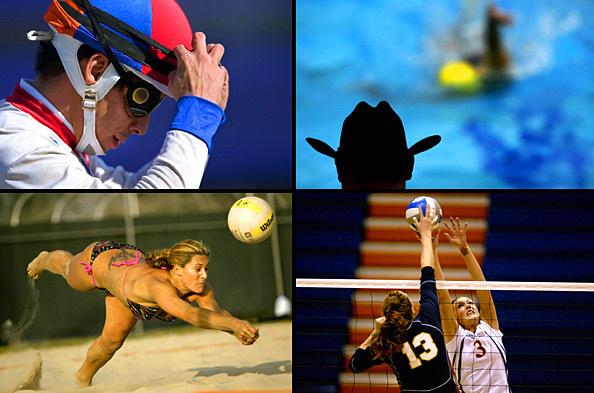 BEST STUDENT PORTFOLIO WINNER: Images from Daryl Peveto's winning student portfolio at Sports Shooter Academy III. "What I liked about Allan's portfolio," said Eugene Tanner, sports picture editor at the Orange County Register and SportsShooter.com member, "Is the good mix of pictures. Strong portraits mixed with great action, reaction and features too. I really liked his rugby shot and how the light hits the eyes of the players." Brown commented on Peveto's winning portfolio: "Daryl was way out of the box during the workshop. He shot the crowd, action, the player’s locker room and the track all with a wonderful view for an up and coming photographer. He was only one to make his way into the locker room and make some very nice photos on Saturday." "I found Peveto's collection of photos from the workshop amazing," added Tanner, "From his photo of the horse getting a rinse down to his photo story on the football game. Peveto showed good hustle and put together a sweet photo story in an hour before the start of the football game." Said Goulding: "The one thing that impressed me the most was Peveto's relentless work ethic. I tell the students that the harder you work during the workshop, the more you get for your money...Peveto got his money's worth. I watched him work at swimming and the football game. He was tireless at both and has the pictures to prove it. Getting into the football locker room pre-game showed initiative and forethought. That ambition alone was commendable but then to come out of there with such good pictures show talent as well. Peveto also has an eye for the quit picture as well. A good example of that can be seen in the diving board photo as well as the trees at Hollywood Park." SportsShooter.com member Donald Miralle, from Getty Images and also a SSA faculty member said of Delgado's winning photo: "A few of the guys really liked a soccer action photo of a goalie diving for the ball. But I immediately was drawn towards Carlos' photo because not only was it one of the first successful feature photos we'd seen all week from outside the field of play, but all the people's different faces really drew you in. Every time you looked at it you'd see a new funny or interesting character involved and Carlos really nailed the right angle to capture the subjects." THIRD PHOTO OF THE DAY: A swimmer leaves a trail of water on the starting block during the Big West Shootout at UC Irvine. Adena Stevens was awarded the annual "Chris Detrick Hustle Award" given to the participant displaying the most initiative. Stevens won a Speed Modulus belt system from Think Tank Photo. "Adena was everywhere during the workshop, "said Brown. "She was always on the go making pictures. Adena didn't take photos; she made and captured photos on the move. I watched her work a photo on the sidelines of a football game for some time till she had what she wanted. She didn't just shoot a few frames and walk away, she made a very nice coach photo over 10-15 minutes during the game," Brown added. The Sports Shooter Academy is the brainchild of Brown and Sports Shooter founder Robert Hanashiro. The workshop provides participants access to major Division I college sports through the Big West Conference, plus other sports including junior college football, horse racing at Hollywood Park and pro beach volleyball. This was the third Sports Shooter Academy. "SSA III got better every night, "said Brown about the workshop, "I watched as the creative bar was raised higher and higher during the four days. I really feel the students walked away from Sports Shooter Academy III better photographers. That's all I can ask for as an instructor." The Sports Shooter Academy III class picture. "This was my first experience with the Sports Shooter Academy. I loved the buzz and the energy created by the participants and by the faculty," said Tanner who helped with the daily critiques. "As soon as I walked into the critique room last Thursday I could feel the energy and excitement of the academy. Every student I spoke with had a great experience and went home with the knowledge to be not just better sports photographers but better photographers in all aspects of the work they do. Sports Shooter Academy III was sponsored by Canon USA, Samy's Camera and Think Tank Photo. Additional support was provided by Camera Bits and Apple Computer. "We had a really diverse group of students at the Sports Shooter Academy III, more so than the first two I think, "Miralle said a couple of days after the workshop. "At first I wasn't really sure if the group was going to gel and work out on a whole, but everyone put their best foot forward, worked very hard, and at the end of the day made some great images. This was an amazing opportunity for many of the participants, I think everyone brought home something from this program, and it reminded me that many of the staff members including myself never had anything like this when we first started taking pictures," Miralle concluded.